If you want to reserve a room at Galt House Hotel, please click the link. If you want to know more about the hotel, please access the hotel website. Many members addressed that they missed the deadline of the proposal due to the hectic schedule at the beginning of the semester, so we decided to extend the Call for Proposals Deadline to August 24. If you planned to submit your proposal but missed the deadline, please submit yours at this time. The proposal deadline is August 24, 11:59PM (CST). Thank you for your interest in participating in the 2017 KYTESOL Conference. The KYTESOL Conference Organizing Team stands ready to assist you with any questions or concerns. Please contact us by e-mail at kytesol2017@gmail.com if you need any help. We encourage you to participate in the 2017 KYTESOL Annual Conference to be held on Friday, October 20 (Pre-Conference Workshop) and Saturday, October 21 in Louisville, KY. Ho Ryong Park, 2017 KYESOL Conference Chair, and the Organizing Team (Youn-Kyung Kim, Patricia Lovett, and Joshua Lance Thompson) are pleased to announce this year’s Annual Meeting Theme: "Toward the Future of Education: Innovative Language Teaching and Learning." Now is the time to advance a paper or session submission for consideration. Please also consider volunteering for the conference. The proposal deadline is August 15, 11:59PM (CST). 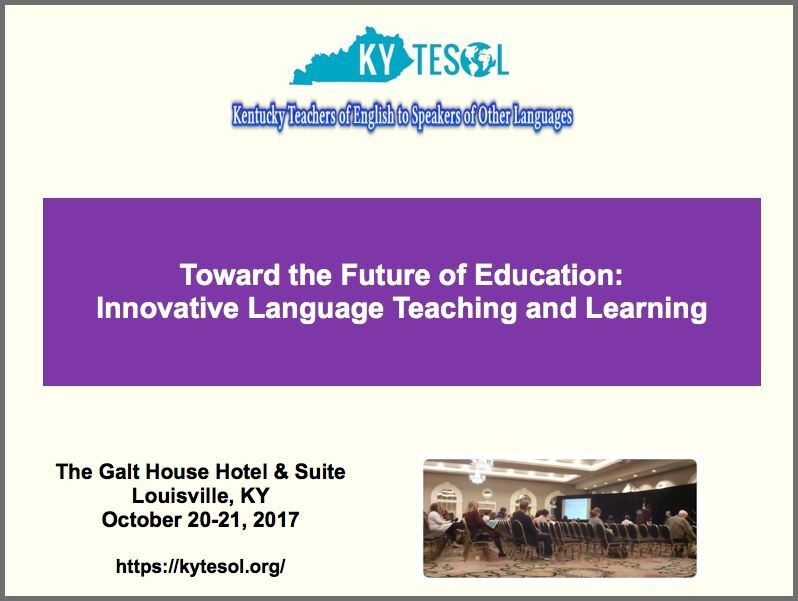 Thank you for your interest in participating in the 2017 KYTESOL Conference. The KYTESOL Conference Organizing Team stands ready to assist you with any questions or concerns. Please contact us by e-mail at kytesol2017@gmail.com. * Do you have great ideas about teaching, learning, and advising? Do you use effective activities and/or tools in your classes? If yes, why don't you share your ideas and activities with other KYTESOL members? If you don't know how to become a presenter, we are here to help you as well. Please contact us by the same e-mail at kytesol2017@gmail.com. We will be happy to help you.